I am incredibly honoured to announce that my image The Ghost has been awarded top honours, taking out the Under Water category at the prestigious 2017 Golden Turtle International Photography Competition. Now in its 11th year, the Russian based competition attracted a record number of participants with 10,165 works being submitted from artists across 92 countries with each piece depicting the intrinsic beauty of our wildlife. The competition brief for the category ‘The Underwater World’ was to demonstrate the uniqueness, immensity and drama of the underwater ecosystem – all of the things which the infamous and hauntingly beautiful albino humpback whale Migaloo embodies, making The Ghost the perfect piece to submit. 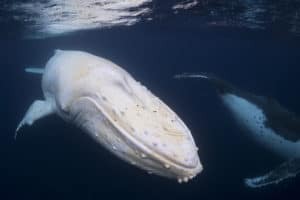 As one of only two known albino humpback whales, Migaloo has long captivated both seasoned and amateur whale watchers all hoping to sight this unique white whale and until this moment he had never been photographed under the water and in such close proximity. The full story of how the image was captured can be found HERE. A black and white version of The Ghost – entitled Migaloo | Byron Bay – can be purchased on my website in a variety of printing and framing options – HERE. Or if you’re in Byron Bay come by the gallery where you can see the artwork on display! We’re located at Shop 7, 8 Fletcher Street, Byron Bay. A limited edition of The Ghost will be unveiled in coming months.